Is it just me, or are jean shorts getting shorter and shorter every year? I thought that trend was over after the Daisy Dukes era, but here we go again. I don’t know about you, but I am definitely not trying to wear shorts that go up as high as my pockets. I’d really given up hope in finding a good pair for summer this year, until I stopped in J.Crew a few weeks back and found these. They’re the perfect length! 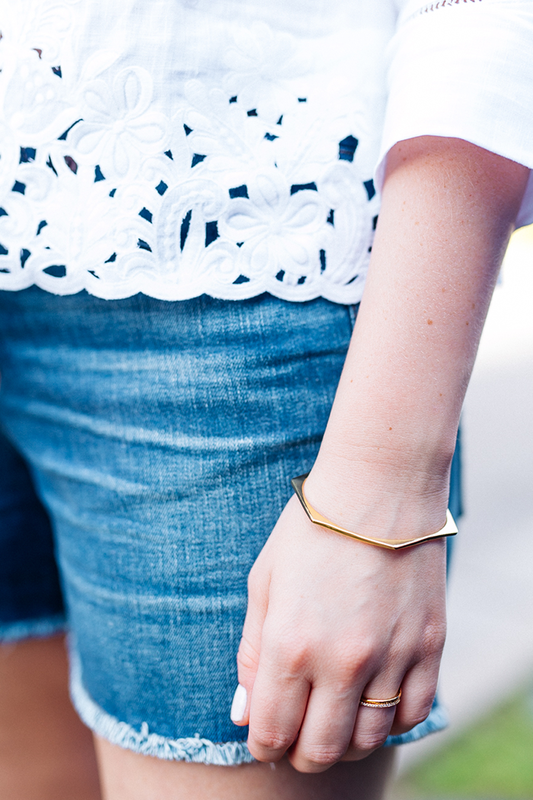 You can cuff them or leave them as cutoffs, which gives them quite a bit of versatility. On a completely unrelated note, I leave for London in less than five weeks! That means I’ve really gotta get going on my itineraries for a few upcoming trips that are happening just a few weeks after I arrive. In the first month, I’ll be getting settled in London and exploring the English countryside, but also making the trek to Berlin, Amsterdam and Prague. I have visited Amsterdam once, but that was in college and I honestly don’t remember where all we went. That’s where YOU come in! If you’ve ever been to Berlin, Amsterdam or Prague in recent years, I’d love to hear your recommendations on things to do, places to eat, and potentially, any fun day trips around or outside of those cities. Please comment in today’s post or email me your suggestions! Any feedback would be helpful! I feel the same way about shorts, it’s crazy they are getting shorter every year. love this pair. I feel the same about shorts! haha. Can’t wait to see your pics from London! 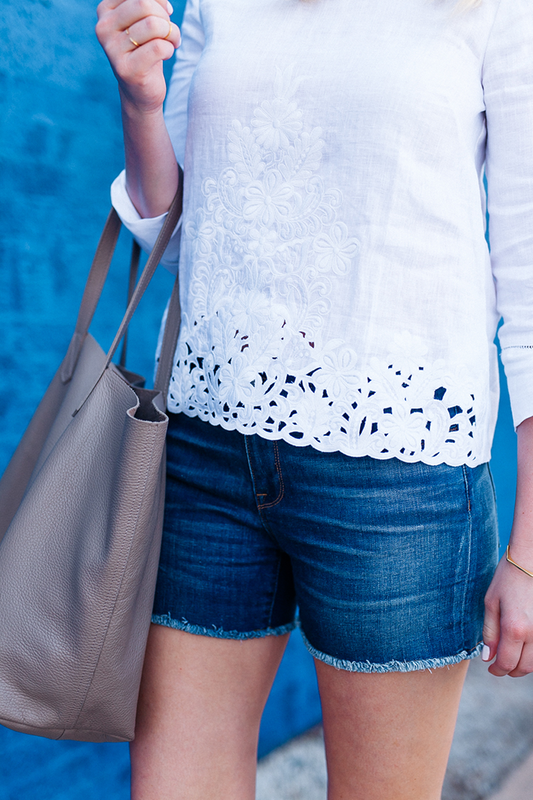 J.Crew has the best shorts! Your top is absolutely stunning and I love those fun slides! Such a great outfit. Completely agree, either I am getting taller or shorts are getting shorter. Those shorts are the perfect length though! I love the detailing on the shoes and your shirt! Great! Ugh, finding a good pair is so hard!! I may need to check these out. I’ve been on the hunt for a white pair. Love them paired with your white top. 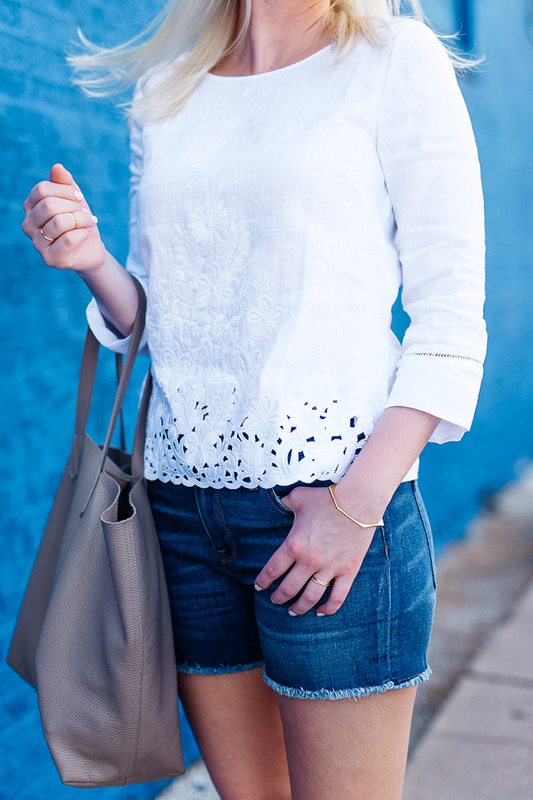 I love this simple look – and I NEED those shoes! What a great outfit! I am glad that I am not the only one to feel that way about “short shorts”. Those sandals are too cute also! 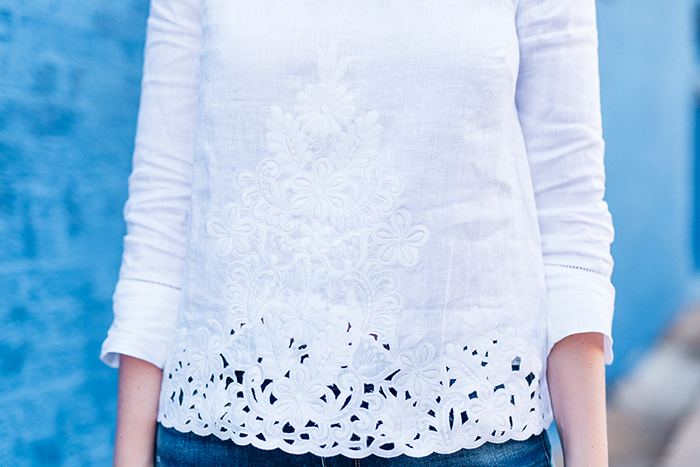 Love the detailing on the top and your bracelet! Totally agree with you on the shorts length; scares me for my 5-year old daughter because I see what these teenagers are wearing (and what stores targeting even 8 year olds are selling!). Love this outfit in every way, M! It’s so hard for me to find the perfect pair of shorts. These are very cute! Yes I feel the same about shorts! I just got a pair during all the sales. They turned out to be shorter than I expected, but I’ll just have to make them work. So excited for your travels! Your upcoming trip sounds amazing…any chance I can squeeze into your suitcase and tag along?! SO in love with this top! I also could not agree more about preferring to be covered by the shorts I wear. I will never know how the Daisy Duke trend v.2 got so aggressive. What a fun trip to plan for!! Great shorts. I like the frayed edges. And I also like the slides. Such a cute summer outfit! Those sandals are so good! I love the design of this top looks great on you fun selection.